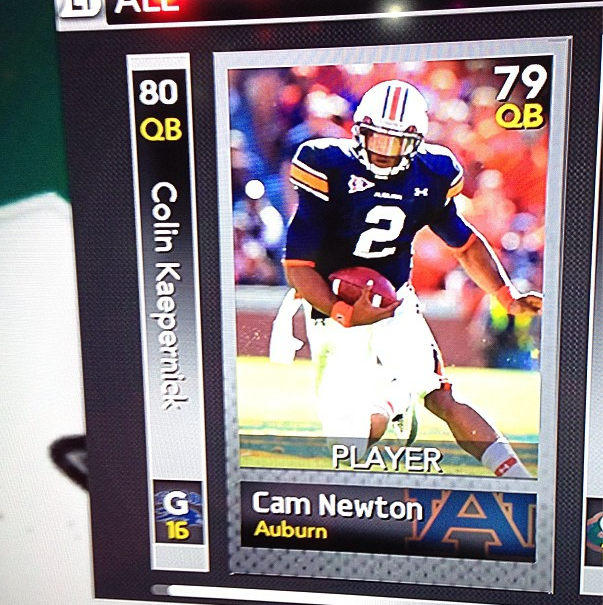 Cam Newton is one of several Auburn greats available in NCAA 14’s Ultimate Team Mode. Real Life Cam Newton made his return to campus this spring to earn his sociology degree, bring donuts, and sparki more Auburn comeback victories against Alabama (from the bleachers). Now, Virtual Cam Newton is also going back to school, and, unlike his real life counterpart, Auburn fans will be able to suit him in an Auburn uniform and score touchdowns in Jordan-Hare. Cam is one of several former Auburn players set to appear in the upcoming NCAA Football 14 as part of the its Ultimate Team game mode. Newton’s inclusion was confirmed by Stephen Gibbons of MaddenTips.com at a demonstration of the mode at E3 last week. Three other Auburn alums have been spotted in Ultimate Team demonstrations: Carlos Rogers (next to Mark Ingram here), Jay Ratliff (at 2:56 here), and Jerraud Powers (at 4:16 here). Over 1,400 players will be featured in the Ultimate Team mode, either via an agreement with the NFLPA for players in the league, or through an individual agreement for retired legends. So will Ultimate Team Cam be the next Tecmo Bo? 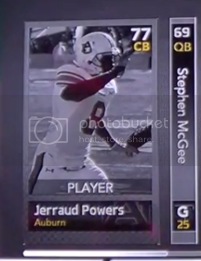 The card pictured above, rated a mere 79 overall, is the silver version of Cam — the Florida version, perhaps — while other, more rare versions, like a gold card and possibly a Heisman card, could exist out there somewhere in PlayStation cyberspace. How will Cam’s gold version stack up? We once again reached out to the experts over at The Gaming Tailgate, and administrator Chris Jacobs, to help make sense of it all. “Cam is an interesting player as he only played one season at Auburn, but from the get-go he was a great player, culminating in the Heisman Trophy,” Jacobs said. “My guess is that his top card will be a rare Heisman Winner card with an overall in the mid-90s. For now it’s not known which other former Tigers will be included, or if any classic Auburn legends will be available. For players like Bo Jackson or Pat Sullivan, EA Sports would have to reach out to those individuals for permission to use their likenesses — but old school stars like Herschel Walker, Archie Griffin and Barry Sanders are included, so Bo, Sully, and others could find their way onto your team as well. So, while these players won’t technically be on Auburn’s roster when you first pick up a copy of the game, you will be able to use the Tigers — uniform, stadium and all — in the Ultimate Team mode, and pull together a team of legends from schools across the country, including Auburn. For the unindoctrinated, explain what the Ultimate Team game mode is and how it will take shape in NCAA 14. How is it similar to other Ultimate Team modes in EA’s games like Madden and FIFA? How is it different? The Gaming Tailgate: NCAA Football Ultimate Team is a mode that allows users to assemble their own team of college greats to complete against others or the computer. Players begin the mode by picking their favorite team and then will receive a Starter Pack that will include enough players to fill out a roster. Also included will be their favorite team’s playbook along with their home and away uniforms. From there, users can earn in-game coins by using this squad in Solo Challenges or in Head-to-Head Seasons. These coins can be used to purchase more card packs to improve your squad or to buy cards from the auction block. The mode is very similar to Madden Ultimate Team and FIFA Ultimate Team. If users are familiar with those modes, they should have no problem jumping right into the NCAA Football version. The player cards are comprised of college greats thanks to the NFLPA license and also individual licensing agreements with legends. What are the differences between bronze, silver, gold, and other versions of cards, and how are ratings determined for each player? The Gaming Tailgate: There are numerous types of player cards and the overall player rating for each could reflect a different point in the player’s career. The different points in their career could be their first game (Freshman), last game, overall career, a specific big game, or possibly Heisman Hopeful or Heisman Winner cards. Not every player will have all of these cards with the most typical card being one that reflects their overall career. With the mode utilizing players who were almost all greats at their respective schools, having cards that reflect different points in their career can help establish a wide range of overall player ratings. What are the odds that we see players like Bo Jackson and Pat Sullivan involved? The Gaming Tailgate: I would hate to speculate on the odds of Jackson, Sullivan, or any other Tiger greats being in the mode, but I am among many fans who are hoping that come July 9 we can say that “Bo Knows NCAA Football.” He has been one of the most requested greats by our community members and by many on social sites and is one of the greatest athletes of the last 50 years, if not ever. For many, not only was he a great Auburn Tiger & Oakland Raider, but he was also a legend on Tecmo Super Bowl. Many NCAA Football fans would love to use Bo again in NCAA Football Ultimate Team. Essentially, whoever opens a pack and finds a guy like Cam Newton will be able to use them on their team, with the uniforms that they selected. So does that mean that we could see a player like Cam on any team in the country — even, say, Alabama? The Gaming Tailgate: All is fair in love, war, and NCAA Football Ultimate Team! Cam is a unique talent and given how much of a role Alabama has been on the last few years, I can see someone putting Cam in a Crimson Tide uniform. While it may seem like sacrilege, a user may feel it is simply a nod to the SEC dominance of the past seven years. NCAA Football 14 hits stores July 9, and the free demo is available for download on the PlayStation 3 and Xbox 360 now. There are plenty more additions and improvements to NCAA 14 besides the Ultimate Team mode; best way to keep up with it all, along with other news, media, blog posts and more, is to visit The Gaming Tailgate’s NCAA Football 14 News and Information Central page. As the July 9 release date approaches, keep it locked to The Gaming Tailgate for the latest NCAA 14 and EA Sports news, and to TWER as the Bo Card Watch begins. Until then, just remember that very soon someone, somewhere, will be playing with their Ultimate Team, watching Cam Newton hand off to Mark Ingram in an LSU uniform during a home game at The Swamp. Photo: Stephen Gibbons of MaddenTips.com. I have to admit, this sounds pretty awesome!